British naval architecture studio Laurent Giles has released the first details of its latest yacht concept the 51.4 metre Challenger 55, which was developed in collaboration with Dr Ian Hudson and Captain Craig Murray. 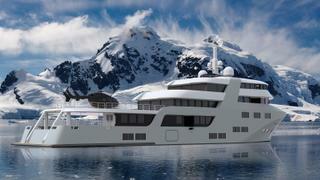 The first in a new series of expedition yachts ranging up to 90 metres, the Challenger 55 has been designed to operate in some of the world’s harshest and most remote locations for up to 25 days at a time without the need for shore support and with the minimum environmental footprint. This voluminous design creates 1,300GT of internal space, leaving more than enough room for up to 12 guests and 16 crew, including guides and security staff. Dr Hudson and Captain Murray's experience working on expeditions for the likes of the BBC informed the Challenger 55's flexibility, and Laurent Giles adds that it can be easily adapted for use as a commercial oil and gas survey vessel, science and research charter vessel or a media production platform, as well as having the ability to collect plastic from the oceans. In its superyacht guise, the Challenger 55's guest accommodation is arranged with a full-beam owner’s suite, situated on the upper deck and complete with its own private lounge, while five further double cabins on the main deck all enjoy en suite access. The lower deck would be split between crew quarters, workshops, technical spaces and an on-board laboratory. Proposed as a Lloyd’s classed yacht built from a steel hull and aluminium superstructure, the Challenger 55’s dynamic positioning system would allow the owner to moor in environmentally sensitive areas without needing to drop anchor. Other key features include an aft-deck helipad, submarine launching capability via an integrated A-frame and a large tender garage. Power would come from a diesel electric propulsion system for a top speed of 14.5 knots and comfortable cruising at 11.5 knots. When trimmed back to ten knots, the Challenger 55 would boast a globetrotting range of 6,000 nautical miles and zero-speed stabilisers would ensure a smooth cruising experience.